Surfbirds on Rithet's Island near Bella Bella, in transition from breeding to winter plumage. Photo by Nancy Turner. This medium-sized shorebird has a fairly plump, stocky shape. Its summer breeding plumage is heavily spotted and streaked; its breast and belly in particular are marked with dark arrow-shaped spots. Its wings and back are darker, with feathers edged with white and scapulars (wing bases) tinged with chestnut red. In winter the surfbird's plumage darkens to mostly solid dark grey with a white belly, though it retains some arrow-shaped spots on its underside. Year-round it has yellow legs, a short dark bill with a yellow base, a white tail tipped with a wide dark band, and white wing stripes - the latter two features are clearly visible in flight. The surfbird is found on rocky shorelines in winter and during migration. Its winter range is long, extending along Pacific coastlines from southeastern Alaska to Tierra del Fuego in Chile. During the spring migration it can also be found on sandy beaches. It is present on the BC coast throughout most of the year in winter and during migration: spring migrants are present from February to late May, while the first fall migrants appear in late June. Fall migrants are seen on the BC coast as late as November or December. Early spring and late fall migrants are difficult to differentiate from overwintering surfbirds, which can be locally abundant on the BC coast. The surfbird's stout bicoloured bill, yellow legs, and plump shape help differentiate it from similar sandpipers such as the wandering tattler and the rock sandpiper. The black turnstone (Arenaria melanocephala), found in the same habitat and range as the surfbird in winter, has an all black bill, reddish-brown legs, and darker grey plumage, and lacks spotting on its white underside. The surfbird's winter range is extremely long and narrow: it stretches along more than 17,500 km from Alaska to Chile, but only extends a few meters above the tide line. 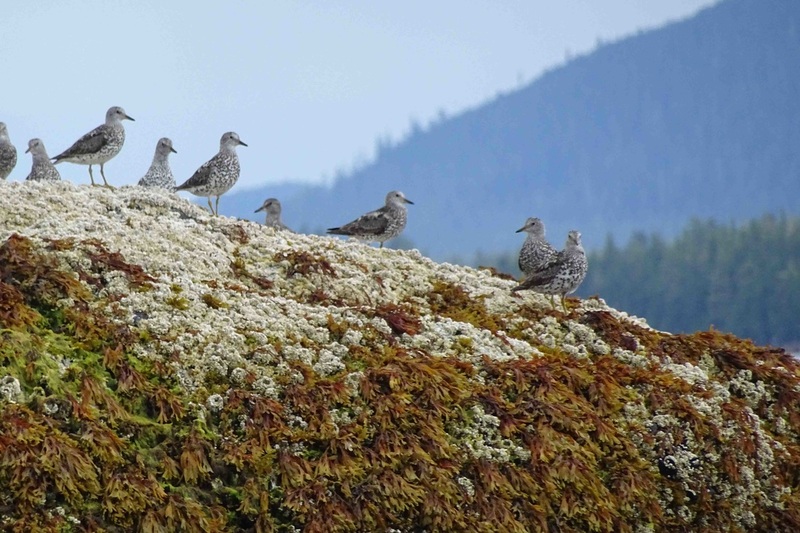 Surfbirds camouflaging among kelp- and barnacle-encrusted rocks on Rithet's Island near Bella Bella. Photo by Nancy Turner. Aphriza virgata (Gmelin). In Klinkenberg, Brian. (Ed.) E-Fauna BC: Electronic Atlas of the Fauna of British Columbia. Lab for Advanced Spatial Analysis, Department of Geography, University of British Columbia, Vancouver. Accessed 02/09/2015. Dunn, J. L. and Alderfer, J. (Eds.). (2011). National Geographic Field Guide to the Birds of North America. (6th Ed.). Washington, D.C.: National Geographic Society. Pp. 190-191. Surfbird. The Birds of North America Online (A. Poole, Ed.). Ithaca: Cornell Lab of Ornithology; Retrieved from the Birds of North America Online. Accessed 31/08/2015. Surfbird Calidris virgata. Audubon Birds. National Audubon Society. Accessed 31/08/2015.